Race Team Practice so from 12:00 - 4:30, Club facilities are open from 8:30 a.m. to 5:30 p.m. Monday through Friday. Our Junior Classroom is located in suite 102 of office building adjacent to the Yacht Club (291 W 22nd Street). Sailing instruction for the race team is from 1:00 pm to 4:30 Students are expected to be rigged and ready to sail by 1:00. 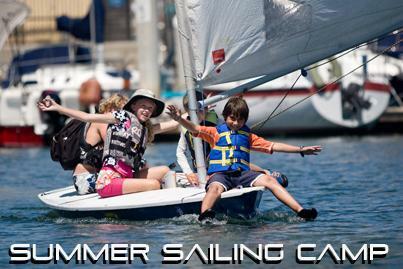 Sailors are also invited to join Regular sailing camp in the morning if needed. All CBYC Instructors are US Sailing certified level one or two sailing instructors, as well as CPR / First Aid certified. Instructors are trained on providing a fun and safe learning environment for your child. Scholarships are available upon written request to Cabrillo Beach Youth Sailing Club based on financial need. Please send your written requests to Cabrillo Beach Yacht Club, 291West 22nd Street suite 101, San Pedro, CA 90731, Attn. CBYSC. Scholarship Application can be found on the CBYC Junior Website. Parents are expected to inform their children that proper self discipline is required while in the program. All sailors and parents will sign a Code of Conduct. Violations of safety or other program rules may result in disciplinary action including suspension or dismissal from the program without a refund. CBYC is committed to maintaining a safe and positive environment for its participants. Our youth sailors have a great time participating in this program. Many return from year to year. We hope your child will join us for this safe and fun filled, learning experience. 1. I, the undersigned, am a parent having legal custody/person having legal custody or guardian of the following minor. 3. To the fullest extent permitted by law, I promise not to sue, I forever release and agree to indemnify and hold harmless CBYC/CBYSC from and against any and all claims, damages, liabilities, losses, costs and expenses including attorney fees, for personal injury to the minor or any other person and/or loss of any property, arising from the minor's participation in the sailing program and shore side activities and any active or passive negligence of CBYC/CBYSC, such as negligent rescue. 4. I represent that the minor is in good health, is able to undertake sailing activities, and can swim well enough in the event his/her boat capsizes to avoid any resulting danger. I further represent that the minor is capable of comprehending instruction, following directions and observing proper safety precautions. I agree to abide by the decisions of the CBYC/CBYSC Board of Directors if he/she finds it necessary to discipline or dismiss the minor for lack of attention misbehavior or failure to follow safety precautions. 5. For the purpose of the Agreement, CBYC/CBYSC shall include its directors, officers, employees, agents, and committee persons of any of them. If any term of this Agreement is held invalid, the remaining terms shall continue in full force and effect. This Agreement shall survive the termination of the minors participation in CBYC/CBYSC Youth Sailing Program activities. By signing below, I certify that I have carefully read and fully understand this agreement. I am aware that this is a broad release of liabilities and indemnity agreement and I sign of my own free will without any inducement or assurance of any kind. I, the undersigned, do hereby authorize and consent to any xray examination, anesthetic, medical or surgical diagnosis or procedure rendered under the general or specific supervision of any member of the medical staff or of a dentist licensed under the provisions of the Education Law and/or Public Health Law of the State of California and on the staff of any hospital holding a current operating certificate issued by the Department of Health of the State of California. It is understood that this authorization is given in advance of any specific diagnosis, treatment or hospital care being required but is given to provide authority and power to render care with the aforementioned physician in the exercise of his/her best judgment may deem advisable. It is understood that effort shall be made to contact the above people prior to rendering treatment to the patient, but that any of the above treatment will not be withheld if any of these people can not be reached. 1. Youth sailors shall be respectful to their instructors and each other. 2. Unsportsmanlike conduct on or off the water will not be tolerated. 3. Youth sailors must stay with their class, instructor, or designated CBYC member. 4. Life jackets are to be worn on the water and on the docks. Shoes must be worn at all times. 5. Always clean up after yourself. 6. Do not borrow anything unless you ask the owner first. Personal equipment must be stored at the end of the day. 7. Stay clear of boat hoists. 8. Club boats may only be used with prior permission of an instructor, club manager or club dock master. 9. Youth sailors under 13 years of age may not be in the clubhouse other than the Junior Room unless supervised by an adult. 10. Youth sailors under 18 years of age are not allowed in the bar unless accompanied by a CBYC member and must follow club rules. 11. Youth sailors may not invite outsiders to use CBYCs clubhouse, dry storage yard or equipment. 12. While on club premises, youth sailors are not permitted to play with knives or guns of any kind, or objects of any nature that could endanger or harm another person. 1. The instructor will handle situations with the individual. 2. Continued abuse of the rules will result in a conference with the Head Instructor and constructive punishment. 3. If a problem continues after step one and two, the CBYC Fleet Captain as head of the Youth Sailing Program or a member of the Board of Directors will meet with the sailor and take appropriate action. The parents may appeal to the CBYC Commodore if they disagree with the action taken. Check to receive information by e-mail. Please check those that apply and provide necessary information.